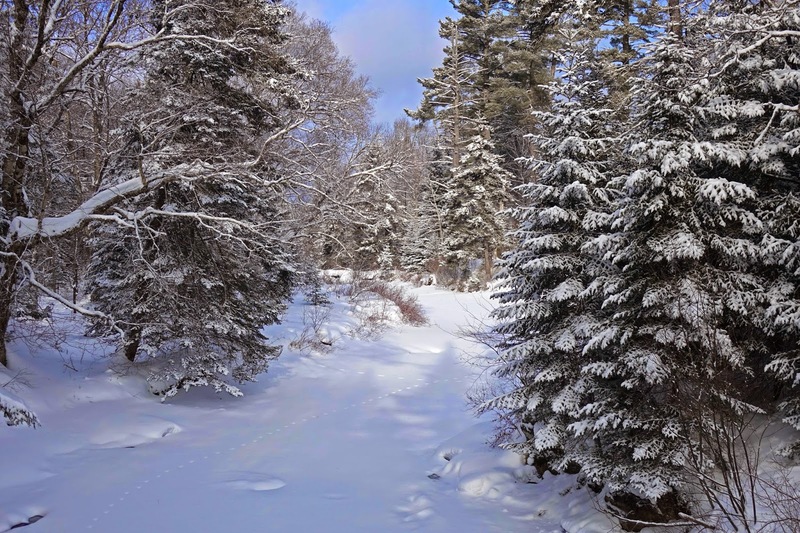 The streams are all iced over and under several feet of snow but that doesn't mean that we don't get out to enjoy the beauty of the mountains in winter. 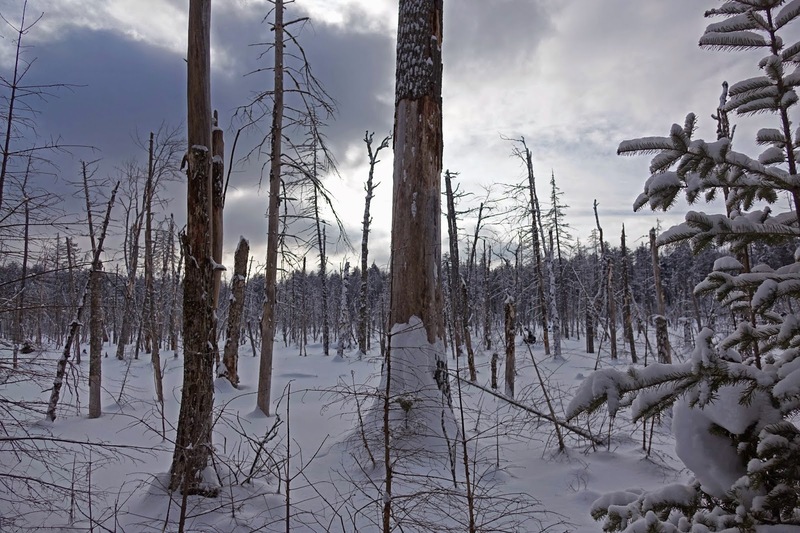 Here are some pictures from a recent outing into the Adirondack back-country after some fresh snow. 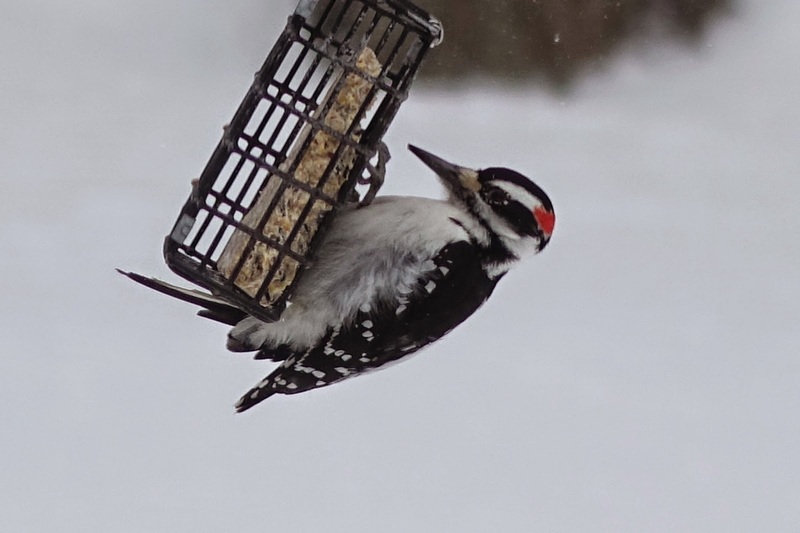 It's another snowy windy day here in New England. 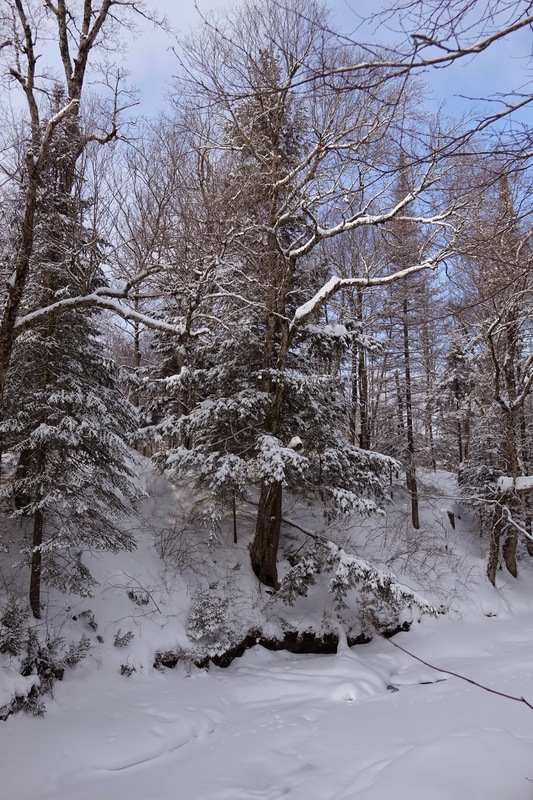 I think it's going to be a while before the streams are clear enough to fish this winter. 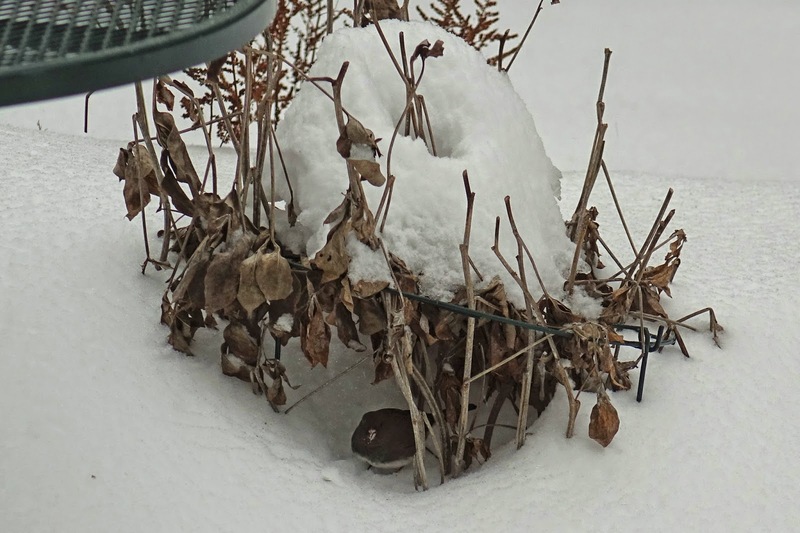 The birds are enjoying the feeder despite the winds. In this final post on European nymphing I will show you some of my favorite flies to fish as a dropper above the anchor fly. I usually tie a triple surgeons knot in the tippet and hang the dropper off the tag end with the anchor about 18" below it. With the dropper you can use a wide variety of flies from weighted nymphs to wet flies. I usually try to "match" the hatch and will often use a soft hackle fly as the dropper. Sometimes the anchor and the dropper will be flies from two different centuries! 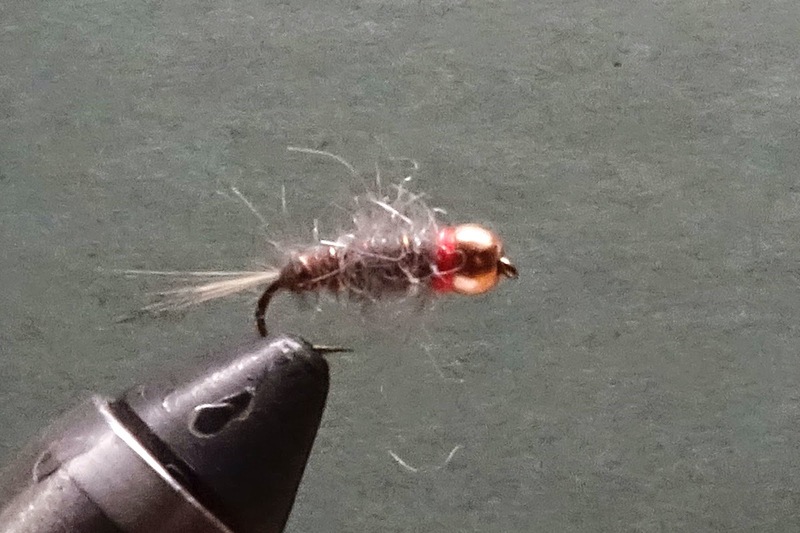 Most often I will fish a soft hackle version of a bead head pheasant tail. My Scottish friends refer to it as an Endrick's spider with a tungsten bead for some weight. 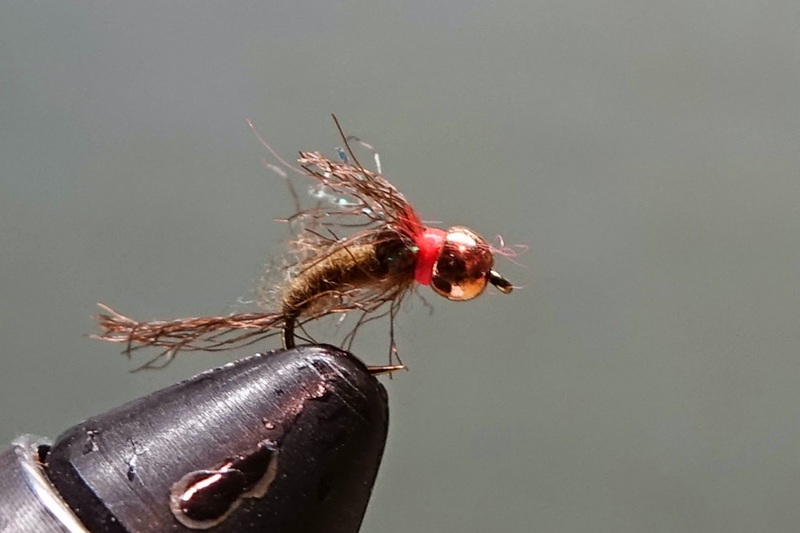 You really can't go wrong with fishing this fly as a dropper and I will fish it from early in the season through the sulfur hatch (hint, hint). I will also fish a black version of this fly when the early stoneflies are making an appearance. I will use a black gunmetal bead, black pheasant tail, some peacock ice dub for the thorax and dark India hen back for the hackle. I find the best size is about a size 16 for both the natural and black versions. Another great fly when the sulfur hatch is on is a brown version of Rich Strolis' super simple. By late summer/early fall and smaller flies are coming into the picture I usually fish a smaller dropper. Rich Strolis' DDT in brown and olive is another favorite when the small olives are predominating. Over on the right is a link to a video of Rich tying this fly. This fly will take a lot of fish in late summer and fall. These are some of my favorite droppers for the Euro rig but as I mentioned you can use any number of weighted nymphs or wet flies as the dropper. So go ahead and experiment and have some fun out there! Here are my top two anchor flies, hands down! 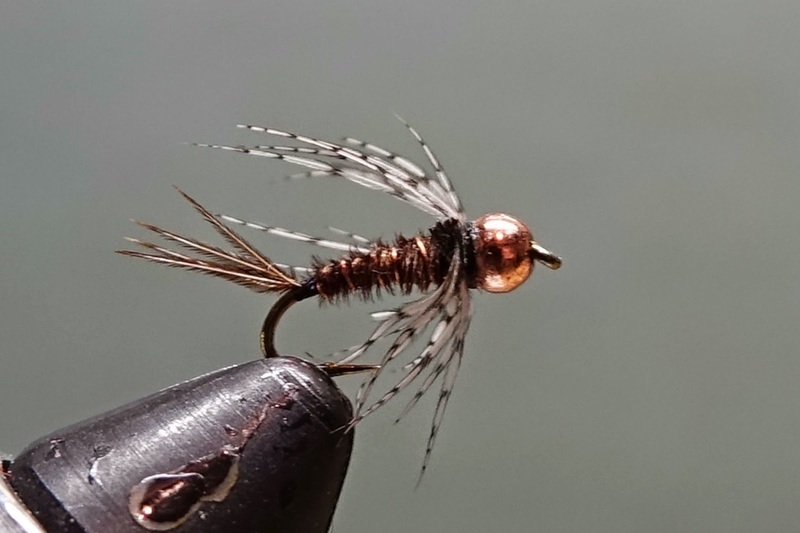 The super simple and Egan's frenchie are simple and quick to tie so I don't mind losing them, which you will if your flies are where they should be. If I had to fish two anchors all season and nothing else, it wouldn't take long to decide. 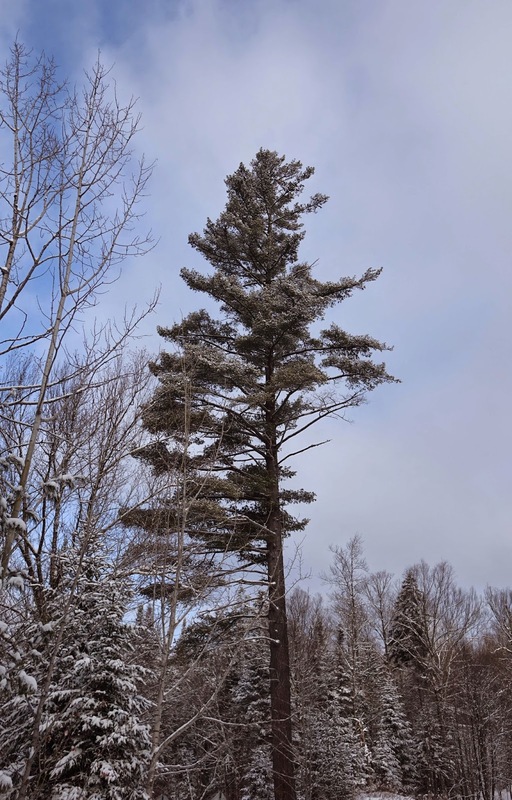 The Super Simple is another Rich Strolis pattern. From spring to late summer this is fly catches fish. This fly looks a lot like the standard hare's ear nymph but with an hot orange hot spot and more flash. You can fish this fly in sizes 16 to 10, but my favorite is a size 12. You can use a European competition hook but a TMC 3761 works well too. 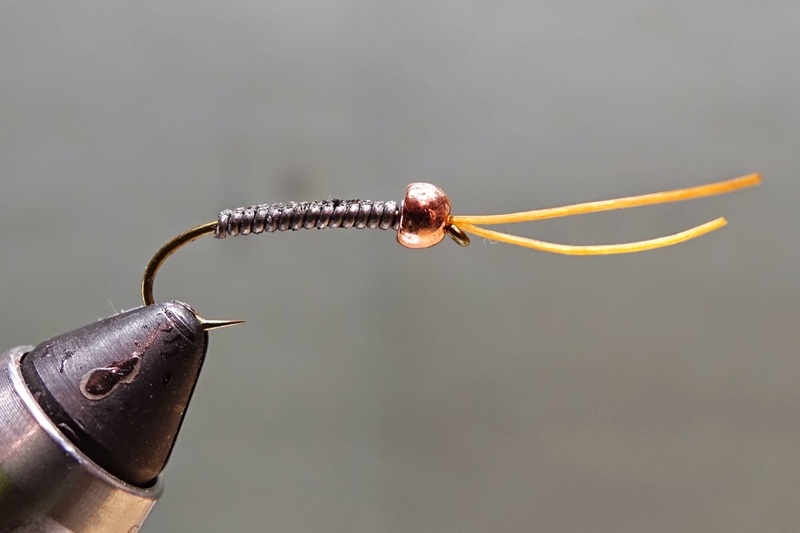 After weighting the hook with 0.030 non-lead wire and snugging it up against the bead, use the heavy thread to build a nice tapered body. Tie in the tail fibers and put one wrap of thread behind the tail fibers to splay them out. Tie in the wire, split the thread and dub the split thread. Re-spin the thread and dubbing to form a loose, rough body. 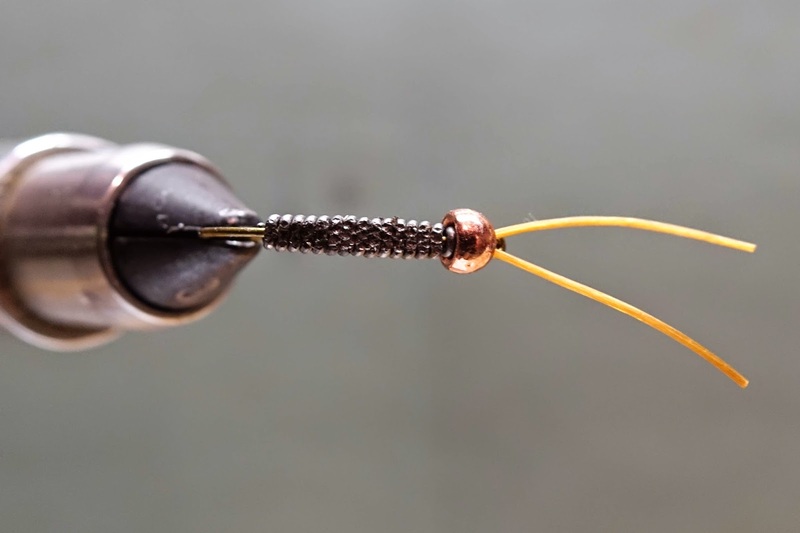 Wrap the wire forward, tie off and build up the orange hot-spot behind the bead and whip finish. While the Super Simple shines from spring to late summer, the Frenchie comes into it's own when the cold winds of fall start to blow. 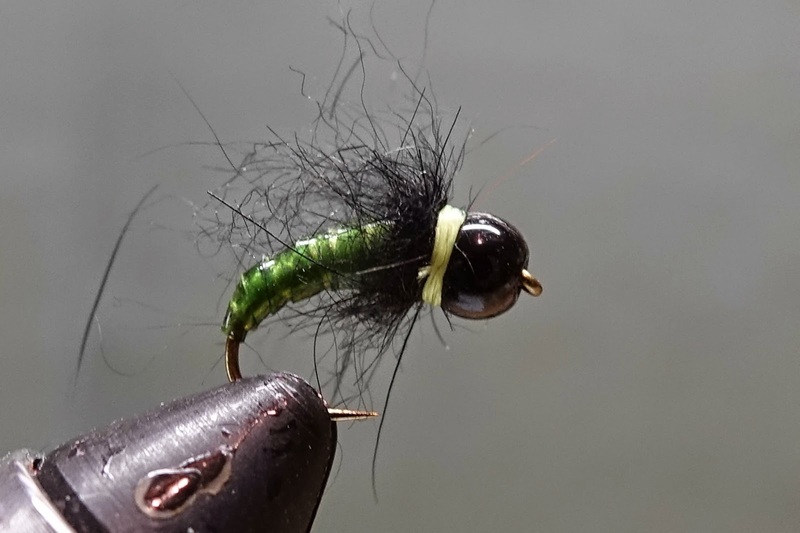 This fly is a quick tie and I usually have half a dozen on hand. 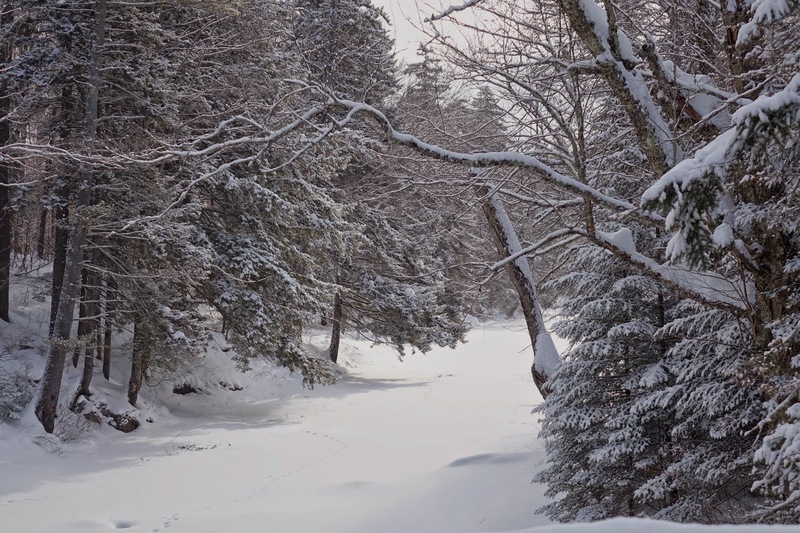 I remember one stormy October day on the Housatonic river where the browns where all over the Frenchie while all but ignoring the various droppers I was using. This is another fly I fish in large sizes (#10). This fly is weighted with non-lead wrap as illustrated in the previous post for the Rock Candy. Today's topic is the foundation of the Euro rig that I fish, the anchor fly. The anchor fly is the heavily weighted fly that gets the whole rig down in a hurry. 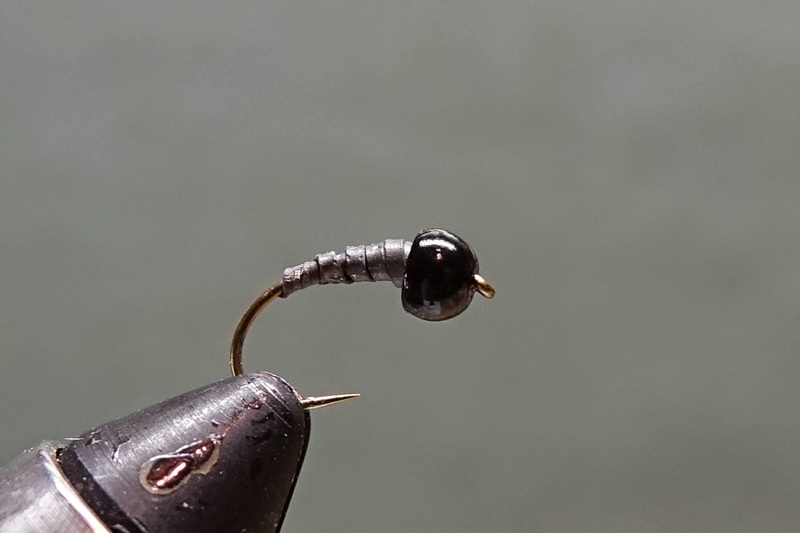 There are two ways I weight these flies and some variations you can do with them depending on shape of the body of the fly you are building. I use either non-lead wire or non-lead wrap. 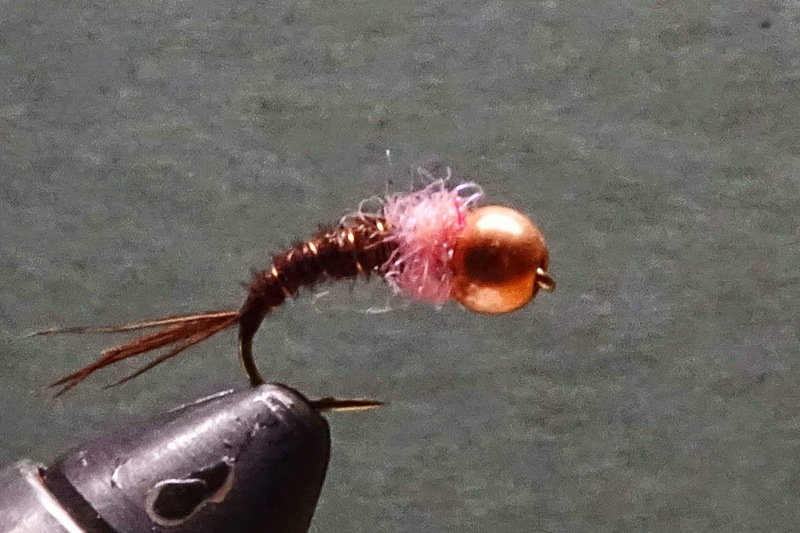 The golden stone fly nymph I like to use is Rich Strolis' shimmerstone. 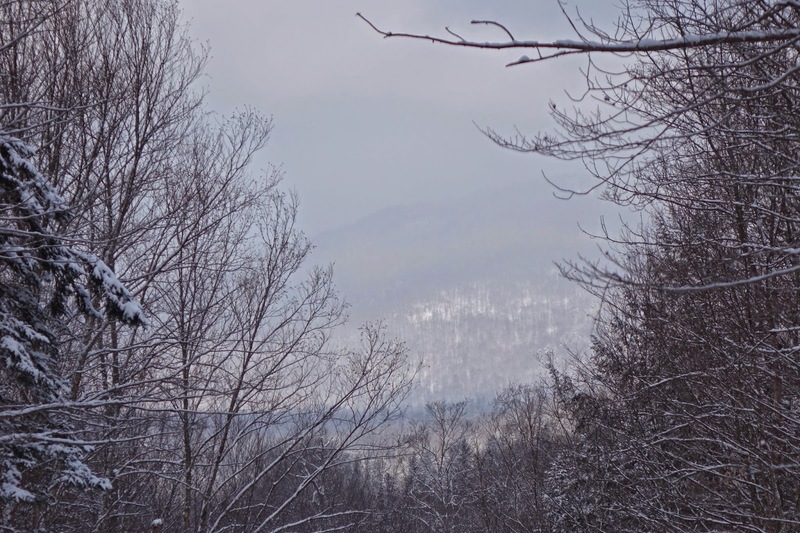 Rich has a nice video on his website and vimeo channel. 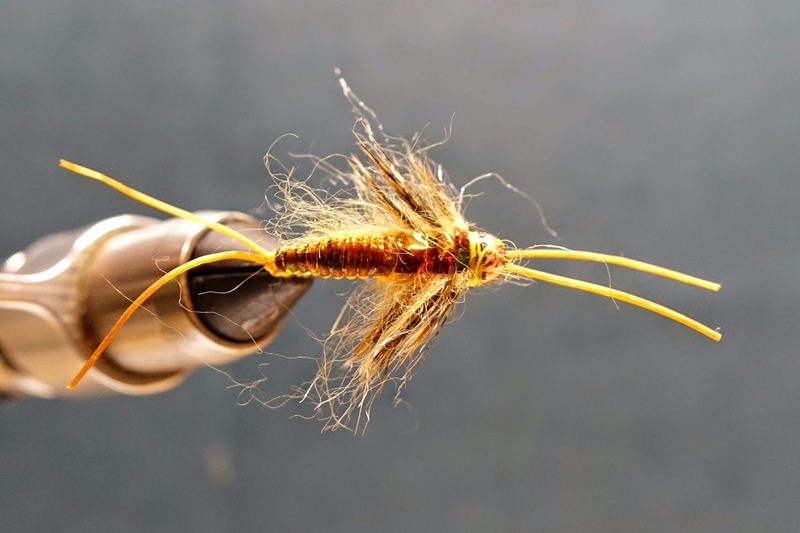 Since this is a more involved fly to tie I would recommend watching the video. For this fly I use 0.030 wire and then shape the wire flat with some flat-nosed pliers. This gives the fly a flat, wide profile reminiscent of a stone fly nymph body. Once the wire is shaped, 140 DN thread is used to build up the base of the fly. 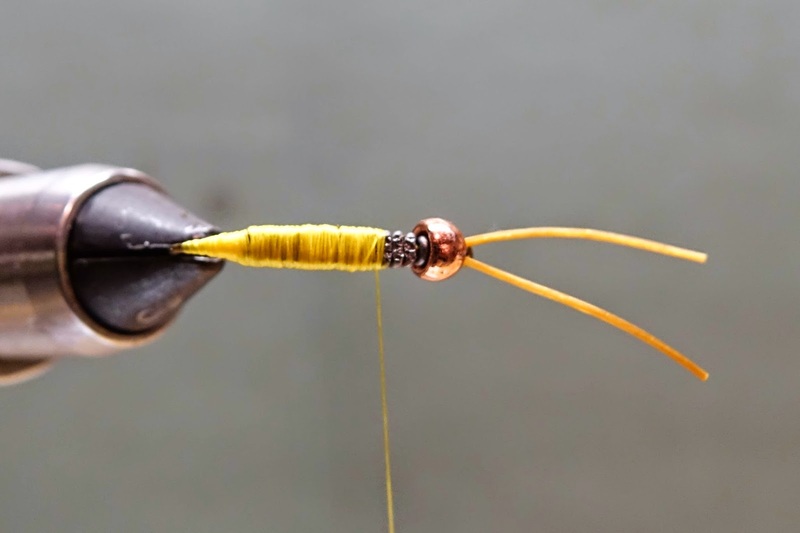 Once the wire is covered with thread and you have a nice base you can proceed with tying the rest of the fly. I use Waspi Span flex for the antennae and the tails and golden stone v-rib to build up the body and a small slip of brown flashy back over the top provides the shimmering brownish back of the fly. thread, hen back is used for the legs and the flashy back is pulled over and tied in. This process is repeated 3 times to finish off the fly. Another way to weight the anchor fly is used in tying the Strolis Rock Candy. Here wire wrap is used to give a more tapered and streamlined body. Next up I will show you two other anchor nymphs I've been using this past season.